Free Shipping Included! 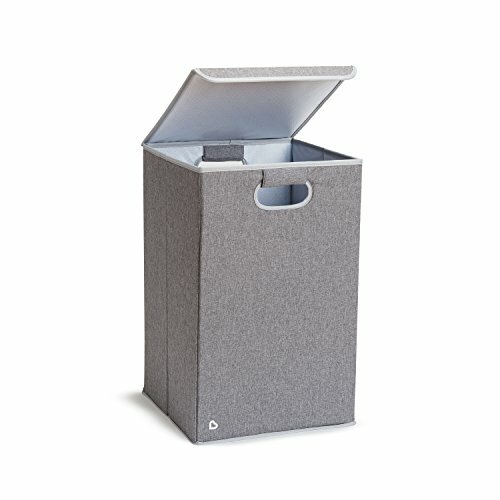 Munchkin Laundry Hamper with Lid, Grey by Munchkin at Indsight. MPN: 17126. Hurry! Limited time offer. Offer valid only while supplies last. It's amazing how much laundry babies can accumulate - you might find yourself washing soiled onesters, burp cloths, and pajamas several times a day. It's amazing how much laundry babies can accumulate - you might find yourself washing soiled onesters, burp cloths, and pajamas several times a day. The Munchkin Laundry Hamper with Lid helps keep all those dirty clothes neatly contained - out of sight, but not out of mind. This large-capacity hamper features a stylish, contemporary design that will fit any nursery or kids' bedroom decor. Designed to be lightweight for easy transport, this baby hamper has padded handles for comfort and a folding lid that won't fall in. It also folds flat for easy storage, making this one laundry essential you can't live without. Collapsible laundry hamper measures 14" W x 21" x 14" D.